European policymakers, healthcare workers, and parents must step up their efforts to vaccinate children against measles amid an ongoing outbreak across the continent, the United Nations World Health Organization (WHO) said today, warning that a recent resurgence in the disease threatened Europe’s goal of eliminating measles by the end of 2015. According to UN data, over 22,000 cases of the virus have surfaced across Europe during the 2014 to 2015 biennium with the outbreak spreading to seven countries. This comes despite a 50 per cent drop from 2013 to 2014. “When we consider that over the past two decades we have seen a reduction of 96 per cent in the number of measles cases in the European region, and that we are just a step away from eliminating the disease, we are taken aback by these numbers,” Dr. Zsuzsanna Jakab, WHO Regional Director for Europe, affirmed in a press release. “We must collectively respond, without further delay, to close immunization gaps. It is unacceptable that, after the last 50 years’ efforts to make safe and effective vaccines available, measles continues to cost lives, money and time,” she added. The WHO announcement comes amid a continuing measles outbreak in the United States and stalled progress in eradicating the virus in the Eastern Mediterranean region, where weak health systems, conflict and population displacement have hampered vaccination efforts. As for the 2014-2015 outbreaks, who lists the affected countries and number of cases as: Kyrgyzstan (7,477); Bosnia and Herzegovina (5,340); Russia (3,247); Georgia (3,291); Italy (1,674); Germany (583); and Kazakhstan (537). Europe’s outbreaks, including the current one, are continuing to occur due to pockets of susceptible un- or under-immunized people, particularly as growing numbers of parents either refuse to vaccinate their children or face barriers in accessing vaccination. In their press release, the WHO urged an improvement in surveillance to detect and investigate all suspected cases; the rapid testing of cases and the identification of chains of transmission; and making “high-quality evidence” readily available. 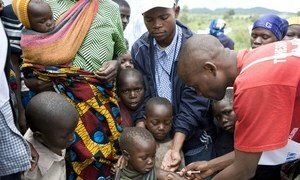 “The priority is now to control current outbreaks in all affected countries through immunization activities targeting people at risk,” concluded Dr. Nedret Emiroglu, Deputy Director of the Division of Communicable Diseases, Health Security and Environment at the WHO Regional Office for Europe.